Today is the feast of St. George. I was, and am, a dragon. My elementary school mascot was a dragon, and I was born in the year of the dragon. I learned I was a dragon, in the latter sense, by reading a red Chinese food menu with gold drawings of animals, eating in a restaurant above the bowling alley. I was pleased. So this dragon was preventing these people from getting water, and they had to either give the dragon a sheep or a lady to distract him. I presume he ate the sheep. God knows what he did to the lady. St. George showed up and killed the dragon, saving many ladies and many sheep. The spear that St. George used was called the Ascalon, after a city in the Holy Land. Ashkelon was a Philistine city, the hometown of famous evil giant Goliath and famous long-hair Samson. Failure of Crusaders to officially take this city, in spite of their victory in battle, marked the end of the First Crusade. For five hundred years, it was an Islamic city. My parents played the Peter, Paul, and Mary version of “Puff the Magic Dragon,”which I loved, and I also had my own 45 of kids’ songs about dragons, including “Puff,” “The Dipsy Doodle Dragon,” and “The Dragon With A Cold in His Nose.” The record cost 79 cents. At school, where I was a Corinth dragon, we watched filmstrips about the Lollipop Dragon and his adventures. If western dragons were supposed to be menacing, western culture certainly failed to get that across to me. The Phoenicians, while occupying in Ashkelon, buried a thousand dogs in a special dog cemetery. The ancient Greeks and Romans left a lot of dead babies, possibly the children of prostitutes and their customers. Those babies were not buried, but dumped in the gutter. Ashkelon is now a beach town, where Israelis of mostly Russian or Ethiopian origin live. Palestinians fire rockets at them from time to time, in the latest conflict over the treasure of waterfront land, now five thousand years old. 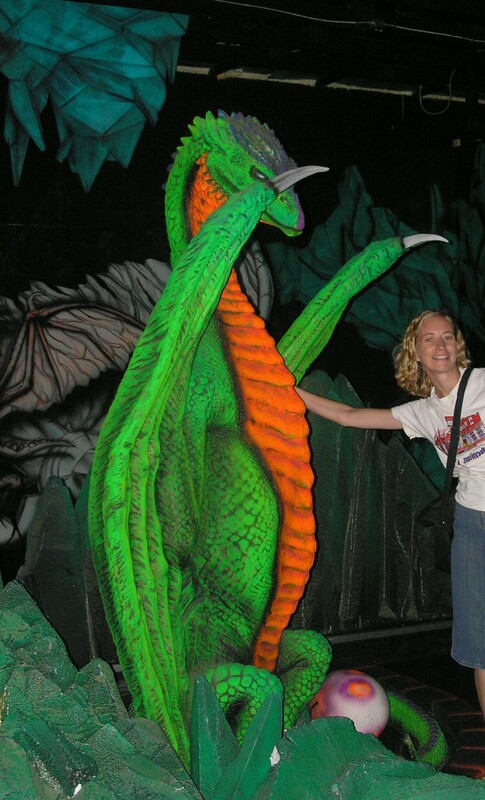 Photo of dragon from fabulous mini golf course.